A tool is any physical item that can be used to achieve a goal, especially if the item is not consumed in the process. Informally the word is also used to describe a procedure or process with a specific purpose. 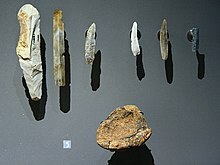 Tool use by humans dates back millions of years, and other animals are also known to employ simple tools.